The Virginia Institute of Marine Science has partnered with the Fly Fishers of Virginia and Dominion Power to help rehabilitate disabled veterans through a unique program called Project Healing Waters. Susanna Musick, head of the VIMS component of the Virginia Game Fish Tagging Program, supported the project by helping veterans tag and release their catch during three fly-fishing training events at the “Hot Ditch” near Dominion’s Chesapeake Energy Center. Trained taggers Marvin Hardisty, Ed Lawrence, and Donnie Smith also volunteered during the events, with Lawrence and Smith tying special fly patterns for the veterans. The final outing of the season took place on January 17. Project Healing Waters—a non-profit incorporated in Maryland—is a nationwide cooperative volunteer program that seeks to assist in the physical and emotional rehabilitation of disabled veterans through fly-tying education and fly-fishing outings. The Virginia Game Fish Tagging Program is a cooperative project between VIMS and the Virginia Saltwater Tournament Program at the Virginia Marine Resources Commission. 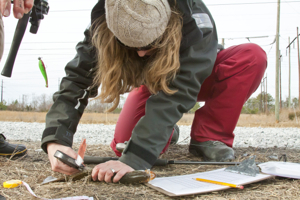 The Tagging Program is supported by funds from the Virginia Saltwater Recreational Fishing Development Fund (derived from saltwater license fees) and VIMS. Despite winter temperatures, participating veterans tagged and released more than 80 fish during the three excursions. 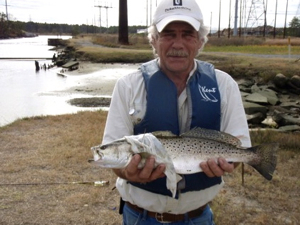 Catches like this are possible at this time of year because water in the Hot Ditch stays warm through the winter, encouraging some fish to linger instead of migrating out of Chesapeake Bay to seek warmer waters. In addition to receiving training in fly casting, the veterans also learned about the importance of catch-and-release fishing and helped contribute to the Virginia Game Fish Tagging Program’s goal of encouraging recreational anglers to enhance data-collection efforts for poorly studied species such as red drum, black drum, cobia, tautog, and speckled trout. In addition to providing a fishing hole for year-round data collection, the Hot Ditch’s catch-and-release policy could have positive implications for recreationally important fishes. Tagging data and citation reports from the Virginia Salt Water Fishing Tournament have shown red drum and speckled trout in the Hot Ditch to be the right size to suggest maturity. This makes the Hot Ditch an important overwintering haven for adult fish that can spawn future generations.